The following data is for Gold Prices in 1974. This was the year in which the CFTC had key discussions with London bullion market makers on how to perhaps deter US citizens from buying gold in mass, see below. 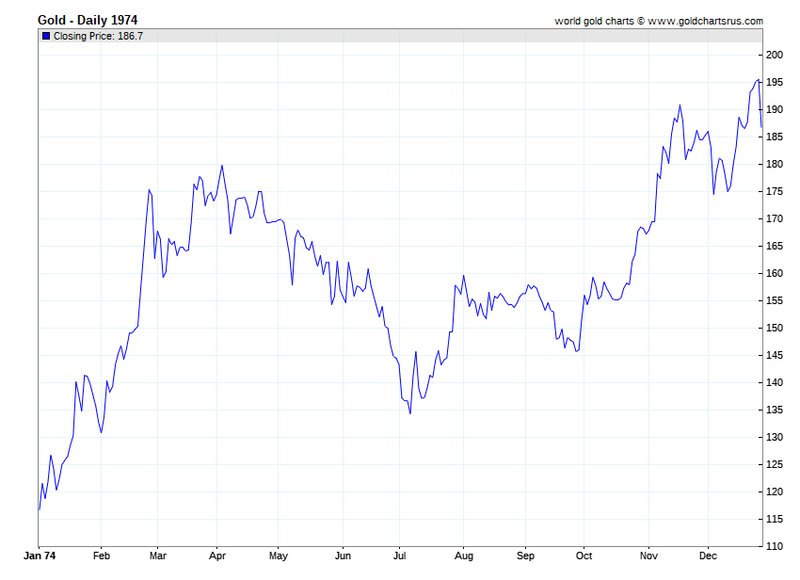 Additional historical Gold Price history and also current price can charts be found on our live Gold Price page. Thanks to Wikileaks interception of US treasury cables from 1974, we have now learned some of the underlying motivations for the simultaneous origin and start of gold futures contract trading on the COMEX (Commodity Exchange Inc.'s inception) occurring around the same time as private gold bullion buying was re-legalized in for US citizens at the start of 1975.
help deter public's physical #Bullion demand. While perhaps, in the beginning, potential efforts to help tame the rising market gold price via the COMEX's new gold futures contract market worked (see 1975 gold price and fist half 1976 gold price declines). Eventually though in the late 1970s, the gold price in US dollar terms got away from the monetary authorities (see the 1979 gold price rise and the then 1980 gold price record). In fact, by early 1980, there were many months in which the US monetary authorities could have gone back on the gold standard given how high the price for gold had risen vs the amount of US dollars circulating in the financial system at the time. By 1979, there were mornings when Federal Reserve Chairman Paul Volker got to work, the first question out his mouth to his staff was to ask about where the gold price was then. Paul Volker is even on record stating that back then 'Gold was the enemy'. One wonders if that also remains the case today for monetary authorities. 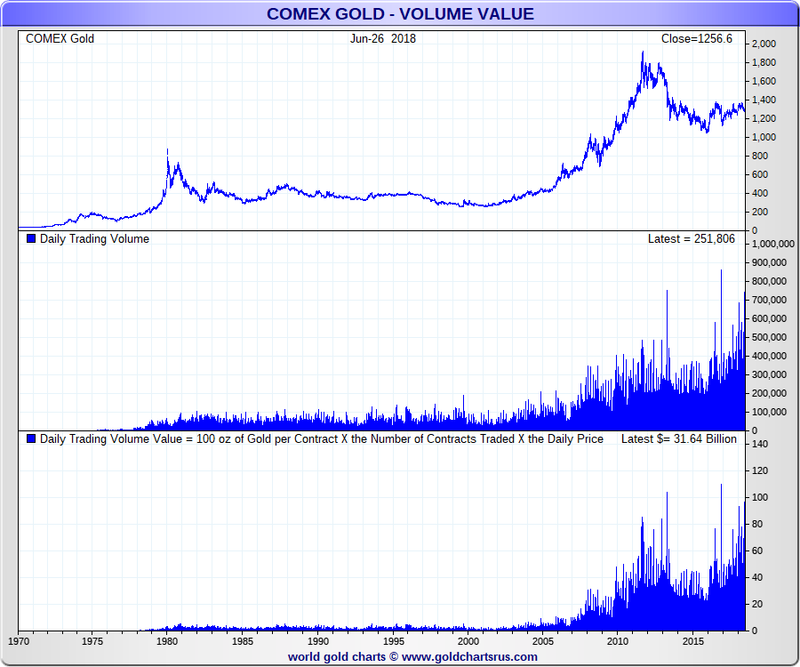 For instance, the all-time highest COMEX gold trade volume occurred on election night in 2016 with President Trump's shocking win. The multi-billion dollar in notional gold futures contract trading on the COMEX helped induce a $100 oz USD intraday gold spot price swing within 24 hours of President Trump's election win. Who might be selling multi-billions of US dollar notional gold futures contracts, precisely just because Candidate Trump unexpectedly won? One would think the trade would have been the inverse (it was at first rising some $50 oz immediately as news broke out on his win). Such market anomalies perhaps lend further credence to the Gold Anti-Trust Action Committee's building case that indeed the gold price is actively managed today not merely by active central bank commodity futures market trading but also possibly other even more centralized bank intermediaries. Perhaps even the Bank for International Settlements (see page 17) also intervenes in the gold market as they display such service offerings to their government and central bank clientele. Viewer acknowledges and is in agreement that SD Bullion does not guarantee the accuracy, timeliness, or completeness of price data displayed here. Nor shall it be liable to any individual or any entity for any delays, inaccuracies, errors or omissions in this price data or any other damages arising in connection with viewer's receipt or use of this data. SD Bullion offers customers the ability to purchase physical precious metal bullion products for asset preservation and prudent allocation purposes, not for mere speculation. Using our online price data, market commentaries, and opinions for speculative purposes is not advised, we are not financial planners nor certified to give you any financial advice whatsoever. The information here is merely for educational purposes.